This small label sent over a few of their releases in compilation format. Fallen Temple Records releases tapes and vinyls of rather obscure acts with specific audiences and put a range of stuff together for this compilation, which shows how wide the tastes of this label and its audiences are. Long-time readers may be familiar with our obsession with Polish band Betrayer, whose 1990s debut Calamity remains an excellent but mostly overlooked piece of melodic death metal with speed metal influences. Betrayer return with a single track, “Beware,” which shows more of a late Morbid Angel (Covenant era) influence, specifically in vocals and rhythms “The Lion’s Den,” as well of more of a reliance on the more aggressive mid-paced speed metal rhythms to emerge in the 1990s. The musicality that allows melody to unite disparate elements into a single experience remains and so despite initial concern over style, listeners will find this track hard-hitting and rewarding after multiple listens. The noodly solo does little for it and the Pantera-ish influences slow down the power of this song, but the quality songwriting remains as does the ability to leave the listener transported after listening. We will be fortunate if we hear more from this under-noticed but intelligent band. 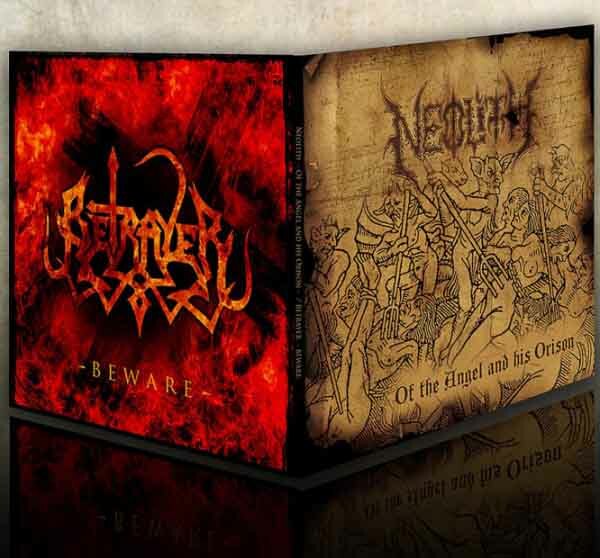 Neolith on the other hand sounds like Krisiun and Impiety had a spawn but balanced it with the second album from Grave. The result emerges as charging death metal with atmospheric use of keyboards. Unlike many bands, these guys seem to understand at least the rudiments of harmony and so it fits together both rhythmically and tonally but the constant drilling rhythm and high degree of repetition without variation of the structural loop within the song makes this somewhat repetitive. A late-song break to a Slayer-style riff then leads to more keyboards mixing poorly with the guitars by creating a competition between sounds instead of supporting atmosphere, which causes clashing influences in the song and sabotages mood. Then it all repeats. This band has a great deal of talent and if they chill out and apply it without worrying what people will think about them, they’ll do great. Behelal suffer from being too adept, which leads to them deciding to adopt multiple styles into the same musical persona, with the result of achieving stylistic anonymity. Fundamentally of a blackened death approach with post-metal style chord progressions and mixed in primal black metal, industrial and other influences, this song plus an intro conveys a lot of potential but not really any specific direction. It concludes much as it began, with a sense of darkness and possible beauty never realized. Compares to Pyogenesis. The world might be happier if bands abandoned pun names, if that is what this is. The listener will first notice that and either be thrilled by it because they are a moron who delights in the trivial, or avoid it because they are disgusted by the flood of mundane morons delighted by the trivial. But assuming that the name is not a pun, consider how you would feel about an album at the pace of early Samael with some of the influences of later. The result requires the kind of mentality that doom metal fans have while listening, but incorporates some electronic influences but basically just drones. Its simple chord progressions are not unpleasant and its riffs somewhat unique, but the main problem most of us have with this is that well-composed or not, it is somewhat boring. The pace allows for little change and the plodding riffs wear us into the ground. Like early Samael, it has a certain charm as mood music since it sounds like demons practicing dirge music in the basement of an ancient house on haunted land. Devil Lee Rot is extremely predictable but catchy hard rock dressed up as some kind of Dissection-formatted heavy metal band with occasional death metal vocals. If you really adore middle-period AC/DC, this might stir your cauldron, but generally this has nostalgia appeal and is dripping in cheese without managing to be fun or entertaining. It is hard to write off this band because of their obvious musical skill, but it does not save the end result from being a warm-over of the past. Ajatus aim for the late days of the 1980s with a fast speed metal/death metal combination that uses fast riffs and death metal vocals but the riff patterns of speed metal. These riffs are predictable but use a bit of melody and songs come together well, which marks this as eternal B-level death metal that compares to Fleshcrawl and Dismember but never quite achieves those heights. Much as you might expect, this band undertakes a fusion of morbid metal and dark grooves. The result sounds like Fleshcrawl covering Autopsy at the pace of early Sleep material, and this delivers a listening experience that is pleasant. Morbid vocals burble up from the background as bass-intense guitar tracks rumble through the front and songs fit together well. Riffs are a bit too asymmetrical and songs too much cut from the same wallpaper, but this release only has two tracks. A full length album might show more. Eternal Rot struggles against contradictory impulses to set up a groove and to use simple riffs, which creates the unfortunate result of droning power chords ad nauseam. If this band could work in more death metal style riffing it might inject some energy into this otherwise fairly plodding sound. Then again, those who like groove tend to get excited by predictability. This band attempts early style black metal with distorted vocals but music influenced by the speed metal years, much like early Sodom or some of the many South American bands who have undertaken this style. Hin Hale keeps up the energy and throws in some good riffs but the background of this release somewhat swallows it in similarity. Finding a voice in this style proves very difficult because of so many riff patterns and song patterns known from the past, so revivalists such as this face an uphill battle. They complicate this with a named unrecognized by most and an unfortunate thin guitar production. Malum in Se blends three generations of Swedish death metal into a single melodic death metal voice that avoids being as random as the post-metal and “tek-deaf” material tends to be. Unfortunately it also avoids being distinctive and so comes across as a well-articulated style in need of direction. Some excellent riffs in here show not only promise, but an ability to stagger riffs for contrast and achieve mood, but the overall energy charges too far ahead and not enough into depth, and many of these patterns seem too symmetrical to be memorable. The insistence on nearly constant vocal rhythms and frequent high speed pummeling make it hard for listeners to stay tuned in to the inevitable conclusion, which is usually able done and worth the wait. This band have made a good job of analyzing their style, but now need to find a sense of making it more of an aesthetic experience of beauty and with that, a larger purpose than the style itself. This band approach Funeral Doom much like old school doom in the style of Saint Vitus with heavy downstroke repetitive strumming guided by the croaking distorted vocals. On the one original song included here, much of the riff-writing approximates the speed/death metal years and while it incorporates a good amount of melody, ends up being driven by rhythmic expectation in the sense of a cadence ending on an offbeat. Many Autopsy influences color this and they result in a somewhat boring song. The second track is a slightly slowed but mostly faithful cover of the Celtic Frost song from which this band takes its name. They successfully execute it but put more emphasis in varying the vocals with each phrase to give it a new atmosphere, but this loses the austere calm and sense of dread to the original. While there is nothing to dislike here, the simple outlook approach to riffs plus slowdown generally equals a type of funeral doom best reserved for going to sleep after funerals.